Take a dozen shipping containers, stack 'em, add floor-to-ceiling windows and you get this huge 4,000 square foot, loft-like structure. 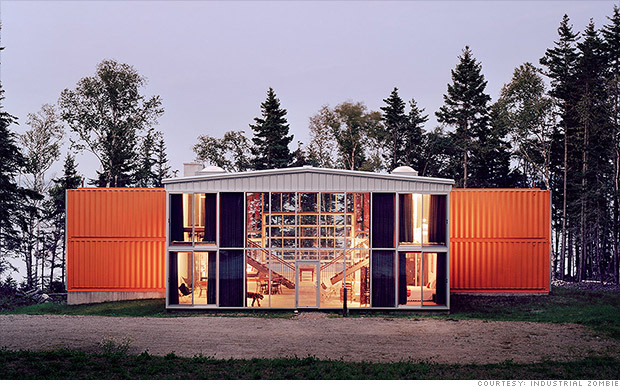 The 12 Container House, as it is cleverly called, was designed by architect Adam Kalkin and built in 2004 on a piece of property in Blue Hill, Maine. There are three bedrooms upstairs and a guest room on the ground floor. Other amenities include two steel staircases, two fireplaces, a breakfast bar and radiant in-floor heating. Want to see what it's like to live there? You can rent out the 12-container house for $6,000 to $10,000 a week, according to the architect's web site.